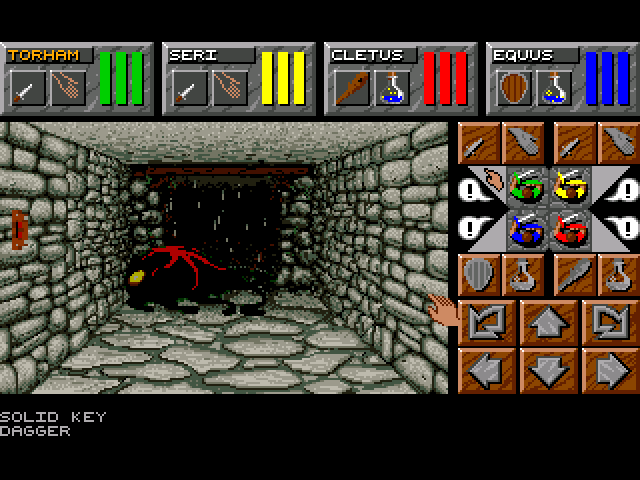 Back on the Amiga days, one series I spent a lot of time with is Dungeon Master. I played a ton of Dungeon Master I and II, more of the second one. Dungeon Master is a tile-based dungeon crawler, where you move a space at a time, and can rotate in 90-degree chunks. Combat was realtime, with enemies moving around and attacking even if you just stood still. You control a party of 4 characters, you could choose from a selection to build your party. Combat is based on the items in each character’s hands, if they are holding a sword you can swing it, etc. Magic is a system of combining runes, you could find new spells through trial-and-error or find scrolls showing the sequence. There was a certain logic to the combination of runes, for example, the fire rune + the wings rune would make a fireball. The game boils down to exploring the dungeon, fighting creatures, and solving puzzles to get past locked doors. Dungeon Master II came out in 1993, the year I graduated high school. Fast forward 19 years (really? ouch.) and enter The Legend of Grimrock by indie studio Almost Human. 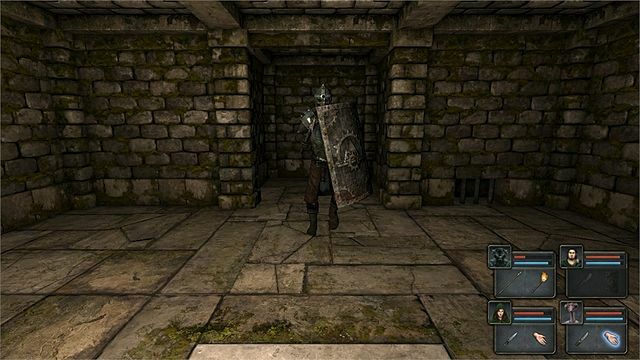 Legend of Grimrock IS Dungeon Master, with updated graphics and sound. The controls, inventory, and magic system are instantly recognizable to people who played Dungeon Master. This is not a bad thing, this is an homage in its purest form, instead of derivative. Grimrock is lovingly hand-crafted, with gorgeous graphics and atmospheric sound. It’s clear these guys loved Dungeon Master, and wanted to bring that experience to a new generation of gamers, as well as a treat for those who played the original. The plot of Grimrock is pretty basic, your party of 4 are criminals of some sort, exiled by the king to die in the depths of Mount Grimrock. They dump you in a pit at the top of the mountain, and you have to make your way to the bottom to escape. I’m only a couple hours in, but it’s looking like there will be a twist or two along the way. The graphics are crisp, with special attention payed to lighting. Most of the time it’s lit with torchlight, which flickers in a realistic and pleasing way. Dungeon Master was 2D, Grimrock has made the jump to 3D but kept the style faithful to the original. The audio is great too, with moody atmospheric sounds and sounds of monsters moving around gives you a good idea where they are, which helps you get ready for combat or find hidden areas. Overall it’s great fun, and I look forward to playing it some more. So far my only complaint is that I have to run Windows to play it, a Mac version would be cool.